Andrea Ferrari, though a performer, is above all a musician. Thanks to his creativity he has always been bent on developing a very personal musical language within the realms of both jazz and improvisation. 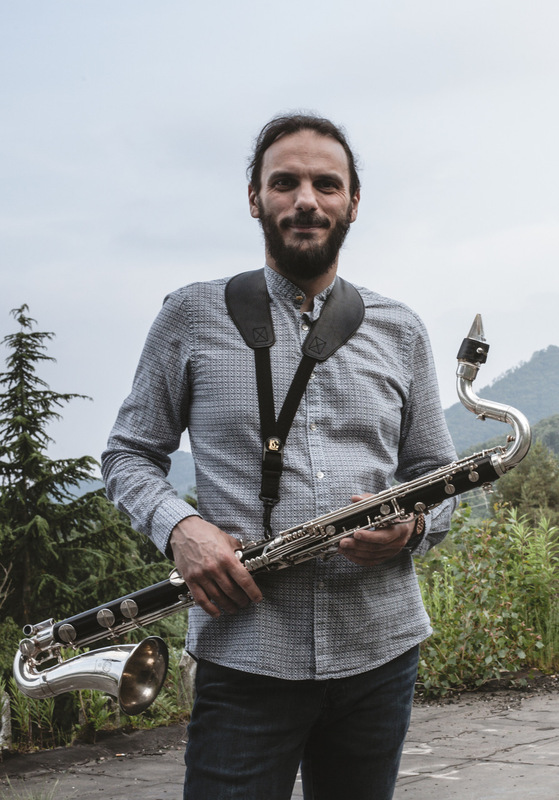 A soloist and virtuoso in a wide range of instruments – bass clarinet, baritone saxophone, bass sax, Eb tubax – he has collaborated with numerous musical projects and continues to do so. He can vaunt a highly original sound and rhythmic language; both these factors make an enormous contribution to his extremely special musical personality, his unique style and recognisable sound-print. His musical education embraces both classical and jazz. He has collaborated with and created several ensembles of different types including Quartetto Martesana, Officina Sonora, Quartet Project, LIC, Arioso Ensemble, QM 5tet, NovoTono, JW Orchestra, Orchestra Maniscalchi, Mixiland Jazz Band, Roger Rota OCTO, the Andrea Ferrari trio, the Andrea Ferrari 4tet. He has played at international festivals and in numerous important theatres: the “Filodrammatici” Theatre Milan, Sala Congressi Strasbourg, PAC Milan, “Pavoni” Theatre Perugia, “Puccini” Theatre Florence, Auditorium Parco della Musica Rome, Teatro della Luna Milan, “La Fenice” Theatre Venice, “Teatro Romano” Verona, “Ponchielli” Theatre Cremona, Il Giardino delle Esperidi Brianza, Milan’s Open Jazz, Bluenote festival and the Bergamo Jazz Festival. He has long devoted himself to teaching clarinet, sax and choral/orchestral music. He has set up educational workshops for in-depth investigation of musical improvisation (Creative Music Lab) that have seen him collaborate with internationally renowned artists like Gianluigi Trovesi, Achille Succi. Among the collaborations worth mentioning are those with Gianluigi Trovesi, Giovanni Falzone, Achille Succi, Marco Pierobon, Roger Rota, Sergio Orlandi, Antony Pay, Gloria Banditelli, Sergio Foresti and the Marinetti Sisters.